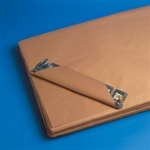 Kraft Wrap Sheets - 100% Recycled Materials. Our wraps are manufactured by industry leading companies and will meet any requirement. All purpose packaging material can be used for: Wrapping, Cushioning, Void fill, Outer cover to prevent scratching, Paint masking, Floor protection liners, Pallet interleaving, bundling and stuffing. Our pre-cut Sheets make packing uniform products easier.